A large bark beetle (8 mm long) known as the red turpentine beetle, Dendroctonus valens. 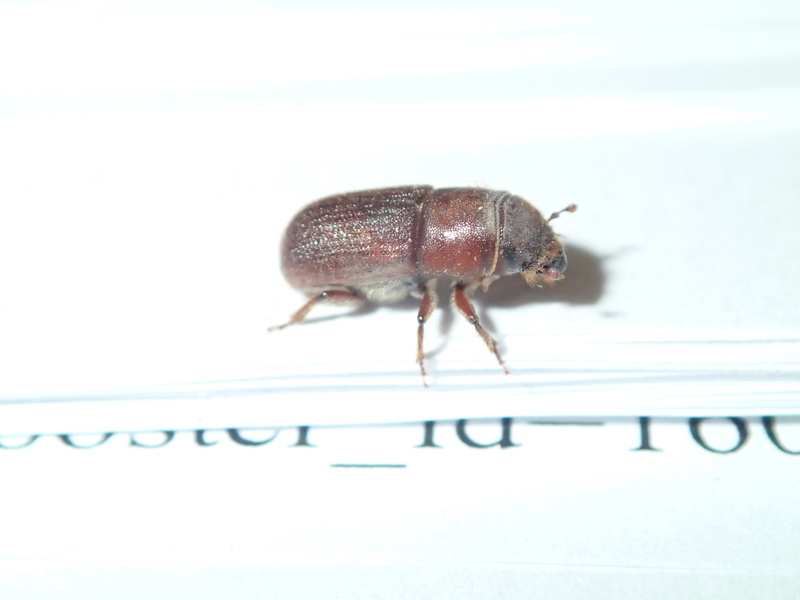 Includes elm bark beetle (Scolytus scolytus), shothole borer (Scolytus rugulosus), Ips spp., Dendroctonus spp. 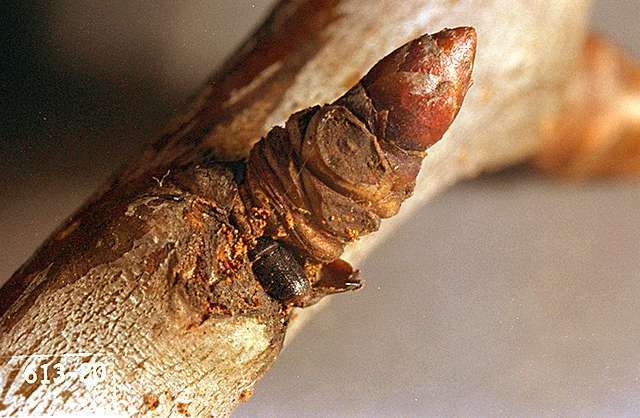 Pest description and damage Bark beetles are small cylindrical beetles that attack and bore into weakened branches of landscape trees and shrubs. They are pests of forest trees, ornamental shade and fruit trees, and shrubs. These beetles are primarily a problem on injured or stressed plants, but healthy plants growing adjacent to infested plants may be attacked. Adult bark beetles are brownish-black and measure from 0.2 to 0.25 inch long. 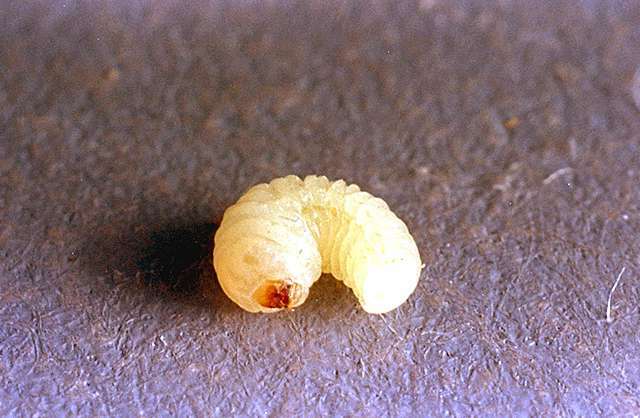 Mature larvae are white, legless, 0.125 to 0.25 inch long and may be found tunneling and feeding within the inner bark of trees. Larvae and adults of these species bore into the cambial and vascular tissues of trees, weakening them and causing wilting and dieback of individual stems and branches. Trunks and branches can be completely riddled with galleries. In worst cases, bark beetles can transmit diseases that then colonize and kill the host tree while the beetle feeds on the fungus. Biology and life history Most bark beetles overwinter as mature larvae, pupae or as adults in wood galleries or 'engravings' beneath the bark of infested trees. In response to warming spring temperatures, bark beetles emerge as adults, fly to susceptible hosts, and bore into buds, twigs and trunks of host trees. After mating, female bark beetles lay small, oval whitish eggs along freshly made tunnels beneath the outer bark. As the eggs hatch, the larvae mine galleries that branch out from the egg-laying tunnel. These galleries are filled with frass and increase in diameter as the larvae grow. When mature, the larvae will pupate in the galleries. The adult beetles will tunnel their way out leaving circular holes in the bark, giving an infested branch or trunk a shothole appearance as multiple beetles exit from the host. Most bark beetles have two generations per season, but a few complete only one generation each year. 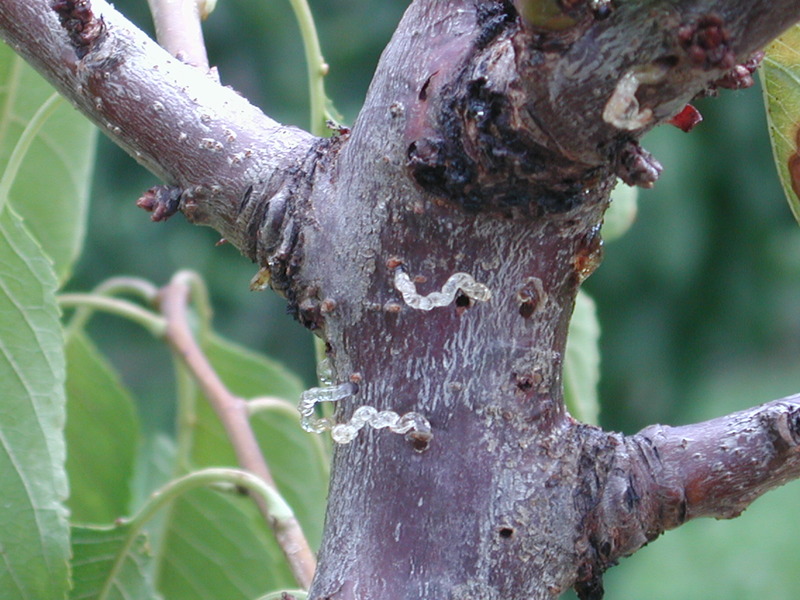 Pest monitoring Examine branches in late spring for holes that are 0.08 inch in diameter, oozing sap, and sawdust. In stone fruits, these holes often are sealed with gummy ooze accompanied by a sawdust-like frass created by the larvae. Beetles are particularly attracted to unhealthy trees. Check for a small hole at the node or base of a bud or bud scar on sickly branches. Bark beetles can be monitored by hanging pheromone traps. However there also is some potential to draw adult bark beetles into an area with the pheromone traps, so they should be placed away from the potential hosts. The best management tool is to keep trees healthy with proper pruning, adequate water, and fertilizer. Healthy trees repel the beetles by plugging bore holes with sap and resins. Remove and destroy any infested wood on the tree or piles of infested green wood nearby, especially cherry wood. Once the bark dries and sloughs off, cut wood is no longer a host for the beetles. Whitewash trunks of young trees to prevent sunburn and reduce potential hazard of attack by shothole borer and other bark beetles. Tanglefoot or other sticky substances applied to the trunk may be effective. 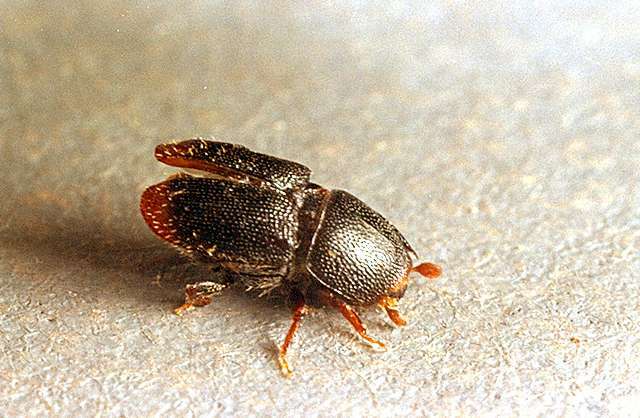 There are a number or parasitoid wasps, predatory beetles and other insects that prey on bark beetles. Birds such as woodpeckers and small birds move up and down the bark to feed on arriving or emerging beetles.